BUFFALO, N.Y. – The new home of the Jacobs School of Medicine and Biomedical Sciences at the University at Buffalo has reached a major construction milestone. On March 22, the university hosted a topping out ceremony, during which one of the building’s very final beams – out of a total of 7,459 steel beams — was hoisted on top of the eight-story structure and put into place at Washington and High streets. The building contains a total of 7,000 tons of structural steel. “Putting the final beams into place for the new medical school building signals the successful completion of the steel construction phase of what is an extraordinary project, for the Jacobs School of Medicine and Biomedical Sciences, the university and the city of Buffalo,” said UB President Satish K. Tripathi. Speakers at the ceremony included Tripathi; New York State Gov. Andrew Cuomo; Buffalo Mayor Byron Brown; Michael Cain, vice president for health sciences and dean of the Jacobs School of Medicine and Biomedical Sciences at UB; and Jeremy M. Jacobs, chairman of Delaware North and chairman of the UB Council. The downtown facility, scheduled to be completed in 2017, is expected to generate immediate and long-term economic benefits for Buffalo. Once open, the medical school building will bring 2,000 UB faculty, staff and students to downtown Buffalo daily, increasing population density in the heart of the city while providing opportunities for retail and housing development, incubators, research parks and other economic development opportunities. “This milestone would never have been reached if it weren’t for the enthusiastic participation of a very broad range of constituents whose collaboration on this signals a dramatic turning point in the region,” said Michael Cain, MD, vice president for health sciences and dean of the Jacobs School of Medicine and Biomedical Sciences. “Literally thousands of individuals throughout this community have been involved in some way in working to realize the vision of bringing the Jacobs School of Medicine and Biomedical Sciences downtown,” he said, “from the faculty and staff who contributed design and programmatic input to our elected officials who helped make the case with the legislature, to the army of workers in the building trades who everyday bring the opening of our new home closer to reality. Now that steel construction is complete, the building’s permanent roof will be added. More than 300 windows are being installed, and starting this summer, workers will install the building’s outer envelope, including its terra cotta skin, which was chosen for the way it complements the region’s rich architectural heritage. The building design was produced by HOK, a global design, architecture, engineering and planning firm, which was selected for the project by UB in 2012 after winning an international competition to develop the best design concepts for the new medical school building. Every day, roughly 300 workers are employed at the construction site, the largest construction project ever in the university’s 170-year history. That number is expected to grow in the coming months as workers in the trades are employed to finish the building’s interior. The new building will allow UB to expand its medical school class size from 144 to 180 students and add 100 new physician-scientists to the UB faculty, many of whom are recruited from top medical institutions worldwide. Once downtown, the Jacobs School of Medicine and Biomedical Sciences will facilitate collaboration with physicians and scientists at UB’s Clinical and Translational Research Center, the Kaleida Health Gates Vascular Institute, Roswell Park Cancer Institute, John R. Oishei Children’s Hospital, Buffalo General Medical Center and the Hauptman-Woodward Medical Research Institute. Construction of the $375 million medical school building is funded by private philanthropy and state support, including funding provided by Gov. Andrew M. Cuomo through the NYSUNY 2020 legislation. Estimated minority and women business enterprise (MWBE) participation planned for the first phase of the project is 24.7 percent and 20.2 percent planned for the project’s second phase. 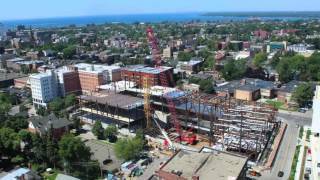 With funding support from the UB Foundation, the university moved quickly ahead in 2012 on designing and building a new medical school building downtown, saving taxpayers millions in construction costs. This historic project is providing construction jobs for hundreds and will exceed state goals for minority- and women-owned business participation. Without UBF’s support, the project would have been delayed for years or may never have happened at all. Instead, in 2017, thousands of UB faculty, staff and students will work, study, perform research and deliver patient care on the Buffalo Niagara Medical Campus.